As it gets closer and closer to the first ever Hello Kitty convention, I have been preparing and planning out my two kittified outfits for the last few months. I didn't need to buy anything extra for my Thursday outfit because I had the clothes and accessories already in my Closet. What I needed to plan out and purchase was mainly for my Halloween outfit and of course, my Hello Kitty nails. Since I wanted my nails to be done by a talented nail salon, I found that Marie Nails in Los Angeles to have an excellent reputation for creating lovely nails. The nail salon is Japanese owned and their nail techs are very talented Japanese artists. With a nail salon picked out, I made my appointment three months in advance. The result for my nails was very kawaii-meets-sophistication. I am a simple girl and love simplicity the best. As I type this blog post, I am fascinated with how very cute my nails are as my fingers are spread out on the keyboard. 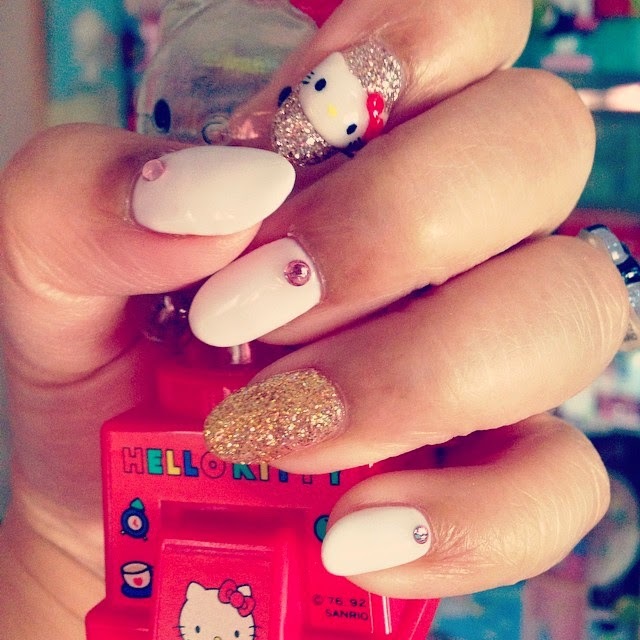 With both hands, the Hello Kitty face on each hand seems to be winking up at me as it blends nicely with the other white colored nails. I like the very fact that my nails are not overly done, but has that simple touch of kawaii-ness. This being my first time to have my nails done in a nail salon, I plan to get a more detailed nail art design for my next visit. I am not sure if I'll go with a Hello Kitty theme again or a Sanrio-fied theme.